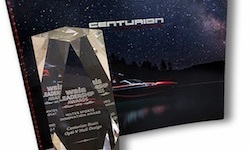 Merced, CA (March 2, 2018) - Centurion Boats was recognized for the innovative design of the Opti-V Hull with the WSIA Water Sports Innovation Award at the 2018 Leadership Awards in Steamboat Springs, CO. The improvement of the World’s best waves, wakes and ride with the Opti-V Hull has garnered another industry-first distinction for the award-winning Centurion Engineering Team. The amazing gains in fuel efficiency are the icing on this development. The Opti-V Hull is not only an award-winner, but decidedly earned Centurion the job of official tow boat for Wakeboard Worlds in Buenos Aires, Argentina later this month. Centurion boats are now clearly offer the best of both Worlds for wake surfing and wakeboarding. Let your local dealer prove that Centurion boats have your number on a lake near you. The Water Sports Industry Association (WSIA) Innovation Award recognizes industry leaders and their products that push the towed water sports marketplace to new heights. Products from various facets of the industry were nominated, and they all deserve a round of applause. For 2018, the WSIA honored Centurion Boats with an Innovation Award for the Opti-V Hull. The goal of the Opti-V Hull design was to continue to improve the World’s best waves, wakes and ride. The Opti-V is proving these improvements on the water with powerful quickly-formed waves, well-shaped symmetrical wakes, an unmatched rough water ride and a 50% improvement in fuel efficiency. The International Waterski and Wakeboard Federation (IWWF) was convinced and chose Centurion as the official towboat of the World Wakeboard Championships for the incredible improvements in wakeboard wake. Add this title to Centurion’s position as the official towboat of the World Wake Surfing Championship (WWSC) and the Opti-V Hull is the best of both Worlds. To experience Centurion’s award-winning Opti-V Hull contact your local dealer or request a test ride online. Centurion boats are the best of both Worlds. Let us prove it to you!